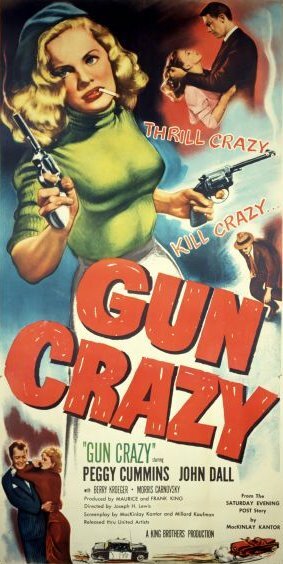 Starring John Dall and Peggy Cummins, the film opens with a young boy who is infatuated with guns. After stealing a gun from a hardware store, Bart is sent to reform school even though his friends and sister testify he would never kill a living thing with it. Bart spends some time in the army and finally returns home grown up. He goes to a carnival with old friends and meets a female sharpshooter. She gets him a job and they grow close only to be fired from the carnival. They get married and are happy for awhile but then she gives him a choice. Either they start robbing stores fro money or she will leave him. Reluctantly he agrees and they begin to get a little money robbing stores and gas stations. It is not enough so she convinces him to pull one last job so they can live a content life together. They begin working at a meat packing plant in preparation. The day arrives and they succeed but then Laurie shoots two people out of fear much to Bart’s horror. They must split up and the manhunt begins. The FBI track them down and the only place to go is back home. His old friends plead with him to surrender but they flee into the mountains with the authorities hot on their trail. They are trapped and Laurie is desperate once again but Bart cannot bear it anymore. Despite the tragic ending Bart ultimately redeems himself but it is too little too late. This was a precursor to Bonnie Clyde and it has its share of tense moments. This entry was posted in 1950s, Crime, Drama, Film Noir and tagged B Film, Femme Fatale, John Dall, Joseph H. Lewis, Peggy Cummins by 4StarFilmFan. Bookmark the permalink.